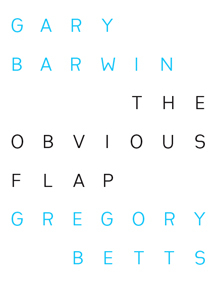 The Obvious Flap is a musical, poetic flux of recurring and recursive images that explore the luminous fringes of language. The text weaves a variety of thematic threads of humour, literary allusions, and narrative into a fabric that spreads into an open, proprioceptive linguistic environment. Gary Barwin and Gregory Betts have concocted a collaborative jam session for multiple larynxes and have made an obvious flap as they have fallen through the mirror into Plunderland.